Organisation accounts have access to the Manage courses where they can start the LMS Course Creation process. Courses are units that may contain multiple lessons which you can enroll your participants in. One of the first steps to providing learning content for your students is to create a course. The steps below will show you how to create a course in the LMS. 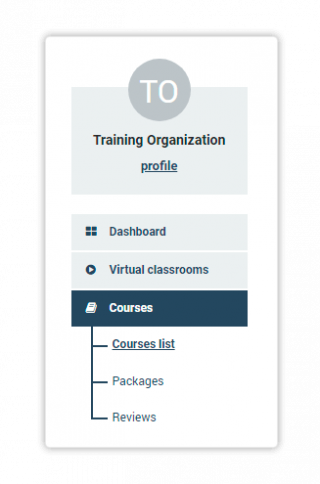 In order to create a course, log in to your learning management system and select the Courses menu which you can find on the left hand side of your screen. 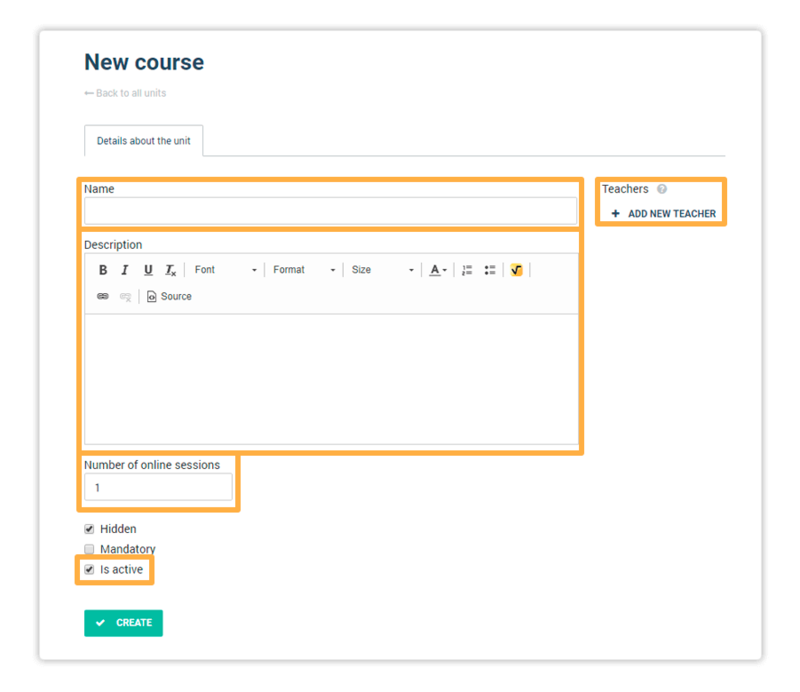 After selecting Courses you will notice that new menus appear, named Packages, Courses, and Reviews. Select Courses list and a new window will open. The window will display a list of every created course and an array of buttons and filters which aim to make browsing and searching through courses easier. Click on New Course to create a new course. You will have to enter the name of the course, a brief description (optional) and the number of online sessions/lessons it is going to include. Make sure that the Is Active box is ticked so your course will be listed as an active one. The next step is to add a Teacher. For this purpose, click on + Add new teacher. A new window will open and will contain a list of users with the Teacher role to choose from. You can type the name of the teacher you wish to enroll for this course and then press + Add to the lesson. When you are done with adding a Name, Description, Number of online sessions and Teacher, click on Create. Clicking on Create will create the course and you will also see a notification informing you of the update. Additionally, you will see three new tabs appear. Now that your course is ready, you may want to review the process of adding it to a package in the previous article. 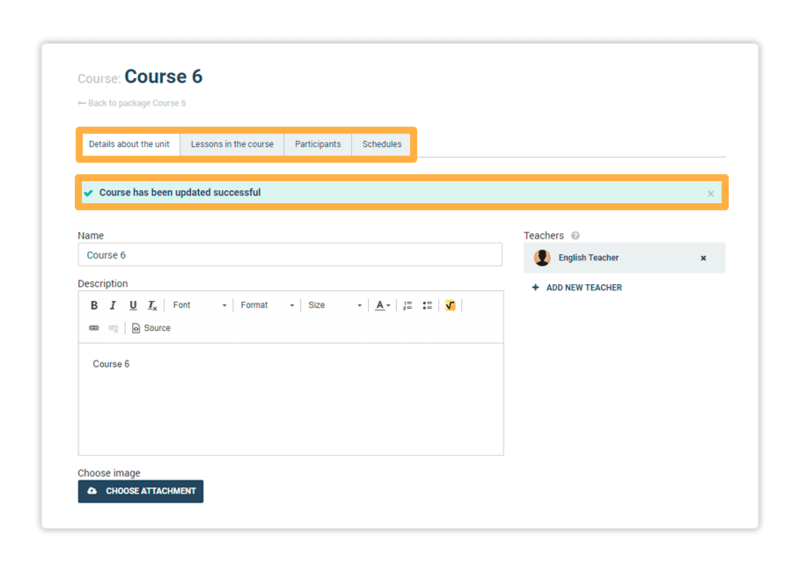 If you have already packaged the course, you may proceed with adding teachers and content to the lessons.